When it comes to the private sector's efforts to curb climate change, the rubber hit the road at New York Climate Week. Companies and their nonprofit partners announced numerous milestones and hosted discussions throughout the city to translate lofty goals into action. Meanwhile, new initiatives were launched to deepen collaboration among the private sector, governments and civil society. A few private sector initiatives crossed new thresholds, a promising sign that corporate action is trending upward. More than 300 companies, including many top apparel companies such as Gap, Nike, Levi Strauss, Guess, Eileen Fisher and VF Corporation, have now committed to target emissions cuts that support global goals to limit warming to less than 2 degrees C. Science Based Targets is a joint initiative of WRI, CDP, WWF and the UN Global Compact. Read the story on Scientific American. Numerous companies including Citigroup, Kellogg, Estee Lauder and Clif Bar joined RE100 and committed to sourcing 100% renewable power across their global operations. Read the story on Bloomberg Businessweek. Champions 12.3, a coalition dedicated to reducing food waste and supported by WRI and the Government of the Netherlands, announced that Kellogg, Campbell Soup, Carrefour, Unilever and Walmart have agreed to simplify expiration date labels and reduce food waste by 2020. Read the story on Markets Insider. The Green Bank Network announced the release of $29 billion in capital for clean energy projects worldwide. Read the story in Environmental Leader. Several new initiatives were launched, all with the goal of fostering green business growth. While the UN's Sustainable Development Goals set the direction of travel, their success depends on the ability of private and public entities to work together and break down systemic barriers. WRI and the government of Denmark announced P4G, a new platform that convenes businesses, national and local leaders, financiers and community advocates to drive green economic growth. Read the story on Fast Company. The Climate Group launched the EV100 Campaign to encourage global business commitments on electric transport. Ten companies including Baidu, HP, IKEA, PG&E, Unilever and Vattenfall are the first members of this campaign. Read the story on Clean Technica. "For-benefit" enterprises, which may be profit-making but are mission-driven, sit at the intersection of for-profit, non-profit and government sectors. The World Economic Forum announced the launch of the Fourth Sector Development Initiative to study and advocate for entities that fit this description. Read the press release for the full story. From small, focused workshops to highly-produced conferences, the Climate Week agenda was packed with opportunities for business professionals to work with others to make more ambitious plans. Leaders from Siemens, PepsiCo, Bank of America, Mars, Walmart and Carlsberg Group joined leaders from government and civil society to discuss how business and sub-national commitments can deliver the expectations of the Paris Agreement. New Climate Institute and The Climate Group released a new report that, for the first time, analyzes decentralized climate commitments in the US. Read the opening ceremony recap from The Climate Group. UN leaders urged business executives to make quicker progress on the Sustainable Development Goals, citing gaps between intentions and results that were uncovered in a recent report. Speakers advocated for more participation from CEOs and financial sector, better transparency, new methodologies for measuring progress. Read the story on Bloomberg Politics. This inaugural forum gathered heads of state and over 200 chief executives to discuss the creation of a more transparent, equitable and sustainable global economy. The Bloomberg Global Business Forum is expected to take the place of the Clinton Global Initiative's annual headline-making event during UN week each year. Browse notable quotes from Bill Gates, Indra Nooyi, Jack Ma, Tim Cook and other business leaders on Axios. 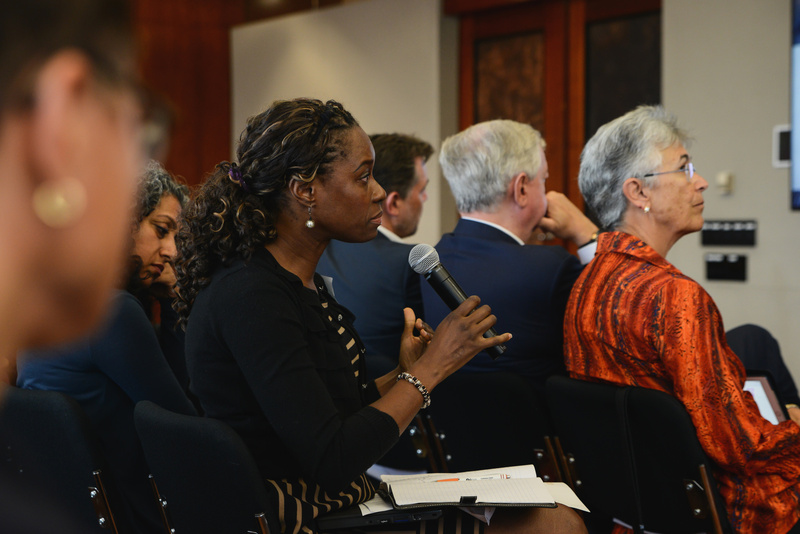 With 40 percent private sector representation, this event included a healthy mix of public and private sector perspectives when discussing strategies for green economic growth. For example, WRI's Kevin Moss participated in a discussion of the relative merits of regulation versus market forces in growing a circular economy. Beyond the talks, many new initiatives, task forces and funds were launched. For the full list, see this recap blog from WEF. WRI's Nate Aden joined fashion industry leaders from Mara Hoffman, Zara and H&M to shed light on the huge—but imprecisely measured—greenhouse gas footprint of the apparel sector and how the sector can embrace sustainable growth. Read the story on Fashionista.